In the recent past, Tucson singer-songwriter Gabriel Sullivan has become somewhat of a ghost. No, maybe not a ghost, but let's call him a part-time ex-pat working behind the scenes. Maybe ghost was better. The point is that over a year after his independent solo release JVPITER, Sullivan hasn't been around much—at least not in a solo capacity. Part of the reason is that he spent last year writing a song per day for an experiment that culminated into The Crucible—a 365-song work that can be heard in full on Sullivan's Soundcloud page. He's also been hard at work in his new studio, Dust + Stone, recording and producing other local musicians such as Billy Sedlmayr and his own Peruvian psych-redux group Chicha Dust. He says you can expect the band's first album, which includes a cover of the Meat Puppets' "Plateau," done with chicha-style arrangements, out in February 2016 with the tentative name Bloodline. "I fell in love with the process," he says of recording and producing. "You find an artist you respect, whose music you enjoy, and it's like a table full of clay." "I'm taking projects whenever I can," he says. "It's become a home base for sure." However, he says you do have to limit your scope a little in a town brimming with musical talent. "You don't let everyone in your circle to begin with," he says. "Tucson is lucky because it seems everyone is doing something worthy and special." He says he'd love to record Vox Urbana in the future, but between all of the other recording of both his and others' music, Sullivan has also found himself touring internationally—a lot. Through those tours he says he's definitely noticed some differences between the crowds at home and across the ocean. "Every artist would say that you're received differently abroad—especially in Europe," he says. "There you have these extremely captive and attentive audiences who are so quiet you wonder if anyone is even listening." "Being from a weird landscape like the desert, it's almost like you're a museum piece to them," he says. "I like coming home and turning my amp up." And turn his amp up he will, as Sullivan promised to his social media followers that the more presale tickets purchased for his upcoming Club Congress performance, the more amps he'll have in tow. Backing Sullivan for the evening will be Brian Lopez (guitar), Jason Urman (keys) and Winston Watson (drums) of Chicha Dust and bassist Thøger Lund, who helped Sullivan record JVPITER. 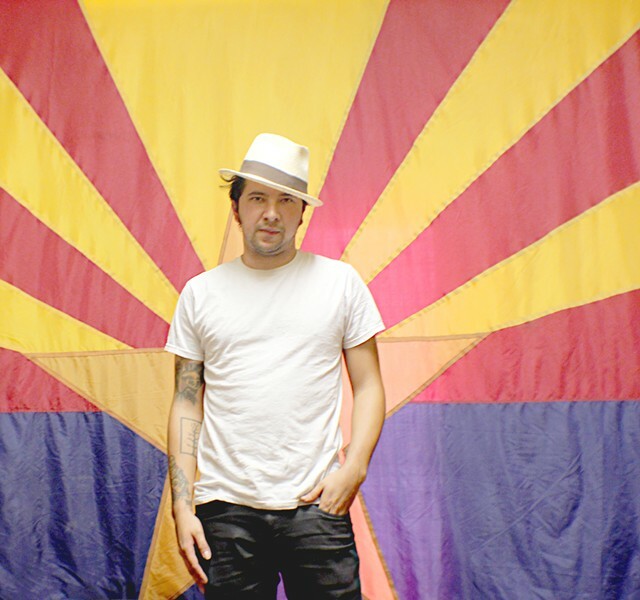 Sullivan became close to Lund through working with legendary Tucson musician Howe Gelb. As a more recent addition to Howe Gelb's all-star Tucson line-up, Sullivan says he's had the opportunity to live out a family dream. "I've been listening to Howe's music since I can remember anything. My dad took me to HoCo when I was younger to see him play and I remember him pointing out Al Perry too," Sullivan says. Years later Gelb reached out to Sullivan, Lopez and Sergio Mendoza in hopes that the three up-and-comers would back him up when he performed at Gelb's induction into the Tucson Weekly's TAMMIES Hall of Fame. Of course Sullivan said yes, but he admits being nervous. "I heard how off the cuff he was. It was terrifying," he says. "The night of the show he was just kind of throwing us into the fire, but that's just how he is." After a few more performances, Sullivan says a friendship formed, though he still can't help but look up to Gelb's "fire." "He's a pioneer artistically," Sullivan adds. "He knows how to constantly challenge himself." Taking that passion, Sullivan and Lund spent one summer in an idyllic, albeit isolated, farmhouse in mainland Denmark, seeking to achieve a sound different from what Sullivan had previously put out. "It's easy to get trapped in what's expected of you—being from Tucson and the desert," he says. Musically, the resulting record has glimpses of Sullivan's favorite genres blended, or as he says, "seeping," into one package. "I was trying to make a more straightforward songwriter record like Bruce Springsteen or something," he says, "but it was too much fun to throw in Cumbia beats and gypsy rhythms." The record also dabbles in a bit of Balkan brass, ornamental Flamenco guitar and his trademark sultry Tom Waits-esque raspy wail. He attributes the latter to his time fronting a "punk band" where he spent tours "screaming his head off every night," drinking whiskey and smoking cigarettes until he sounded more like Howlin' Wolf. "At the time I thought his voice was the most powerful instrument I'd ever heard," he says. "I've calmed down though. In fact, now we exercise every day on tour." Conversely, his take on writing for The Crucible was much more literal, taking inspiration from even seemingly mundane daily tasks. "The lyrics were coming from everywhere. Even the act of emptying my French press in the morning and throwing coffee grounds on the dirt became a song," he says. "It takes discipline to try to find inspiration in anything." However, the true motive behind The Crucible was one of struggle. Eight months after he finished JVPITER, Sullivan couldn't find a label to bite on the record he pored himself into. "It's that frustration of waiting for someone to tell you your worth and waiting for someone to get me moving. It was terrible," he says. "That's not why I fell in love with music." Now, his endeavors in self releasing, recording and producing have shown him something else—something more. "Music is exactly what you make it out to be," he says. "No one else is going to do it for you so you have to pick it up yourself." For his next record, he knows he'll be pulling from The Crucible, expanding on concepts and melodies he began in that project. He says to expect something in the way of Lee Hazelwood with twangy guitars and big strings in the future..